I've seen a few bloggers do something like this, and it looks kind of fun, so I decided to do my own spin on it! TBR showcase is a feature in which I take 4 or 5 books off of my to be read pile and, well, showcase them here on the blog. Then you guys can comment on if you've read these books and what you thought of them, and maybe you'll help me bump these books up to the top of my TBR! Have you read any of these books? Which one should I read next? Great bunch of books. Haven´t read any of them. But heard good things. Both Supernaturally and Incarnate is on my wishlist. I have only read Incarnate by Meadows and I didn't really like it. It started of great and I thought it was going to be such an epic read, I thought we finally got fantasy into the YA genre in a great way. However after those first 50 pages I started to dislike the novel more and more as the read page count kept going higher. It just wasn't all that amazing. 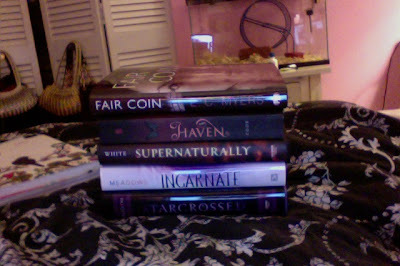 I haven't read any of the other books but I do want to read Starcrossed!